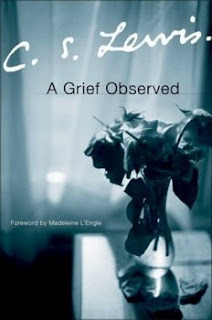 I was hearing some alarm bells ringing when I first started reading the book, A Grief Observed. The foreword and introduction to this short book sounded as if C. S. Lewis gave up his belief in God through his time of grief. Even as I was reading the first chapter of the four, I was feeling uneasy when Lewis seemed to give up his hope of heaven, and makes much out of death. But I believe Lewis was simply being honest, honest about how he felt. As the book progressed, this seemingly un-Christian confession was elaborated and in the last chapter of the book, his faith and hope in God was restored, or rather, more at the front of his confession, since I do not think Lewis had lost his faith at any point in the earlier chapters. Regarding the real content of the book, or what I learned through it, I don't know how to put it. I am not sure if I learned a great deal about grief, since this book is a very personal memoir than a book that was intended to teach you about grief and how to deal with it. And I cannot say that I enjoyed the book either, for there in the book, I found a soul, a Christian brother, agonising over his wife's death. I will not say it was a bad book, or not worth while reading, I just find it hard to describe the book and my experience of reading it, because the book is utterly honest. I think it would be helpful for anyone who wants to minister to others, and all Christians ought to do so. Although I said this book isn't intended to teach you about grief, hearing from such an articulate and honest Christian brother how he felt as he went through a dark and painful time surely helps when one of your friends is in a similar situation. Or even for yourself as well. Additionally, while he does not develop his ideas fully in this book, his insights about other issues in Christian living in general also seep through. I will post up some quotes from the book which I think show such insights in coming days. Now, although I said this book would be helpful for any Christian, it is not a must, nor is suitable for everyone in all different stages in their Christian walk. So, while I would recommend this book to Christians, I think you will want to take time in reading it, and ask God for wisdom how you take in what is in this book.